The Pz.Kpfw. II DAK (Panzer II DAK) is a premium Rank I German light tank with a battle rating of 1.0. It was introduced in Update 1.41.27. A premium version of the Panzer II C, it costs 250 Golden Eagles. 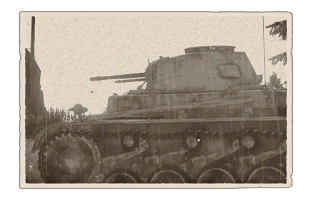 This is the first vehicle in the German ground forces tech tree. It is quick and nimble, however as a reserve tank it does not have a very heavy punch. The 20mm gun does not have a huge penetration rating, however the armour piercing types are capable of taking care of most of its reserve vehicle opponents. This is a very quick little tank when fully developed. However, even completely undeveloped, it has a decent turn of speed. It has a high rate of fire which makes it very forgiving as far as aiming and hitting is concerned, and even allows a (relatively) accurate fire on the move capability, assuming the ground is not too rough. On rough ground the Pz II pitches like a lifeboat in a storm, making firing on the move impossible. However, this is where you are able to hide in the furrows between rises, allowing you sneak up on the enemy and attack from surprise. Its rate of fire is a problem, however, as reloading its magazine can take a rather long time when in combat, and if you change ammunition during a fight, the magazine will be changed out immediately after the next shot is fired, not when the magazine is emptied. (Armour Piercing Incendiary tracer – High Explosive Fragmentation Incendiary tracer) shell 50% of this belt are useless against tanks or planes. However against other SPAA this belt can reliably take out crew, armament, ammo and engine. Having one belt in reserve does not hurt. (Armour Piercing Incendiary tracer) shell Intermediate usage until the better PzGr 40 can be used. Decent enough versus light tanks and other vehicles from the rear. Due the lack of HE filler underwhelming damage, yet still better than the PzGr 40. (High Velocity Armour Piercing tracer) shell Best penetrating shell of this vehicle. However, the damage effects are very poor. In close combat snipe for modules and crewmember for increased survival rate. Nothing is more annoying than emptying a clip and then to get killed in the reload because the enemy gunner survived. Against angled armoured it is not very effective like any other APCR shell, this is offset by the very high base penetration though. The main key to success with this vehicle is to drive aggressively, trying to get shots at relatively close range (100m-300m or even less). Aiming for the enemy's weak spots, it is often possible to set your opponent on fire, allowing the Pz II to take on vehicles beyond its battle rating. Where possible, try to use the terrain to remain hull down. Even the smallest undulations are quite often enough to mask your hull, allowing you to take quick shots with minimal risk. However closing the distance quickly with your opponent is really the only way to set up a kill, as your armour is not enough to bounce a shot in a face up fight. The gun can be utilized as an AA gun. The crew is prone to knock out easily. In 1934, the development of the new German tanks, which would be the Panzer III and Panzer IV, was falling behind schedule despite an urgent need for tanks. As a stopgap solution until the designs were finalized, the Germany Army submitted a request for a new tank, giving the responsibility of designing to Krupp, MAN, Henschel, and Daimler-Benz. The product was a design that is based off the German Panzer I light tank, but was larger with the addition of an extra bogie wheel and had a 20 mm autocannon as its main armament. The finished tank was designated the Panzer II and production was to start in 1935, but did not start delivering tanks until 18 months later. At this time, it was in a low rate production status by 1936 in the Panzer II Ausf. C variant. 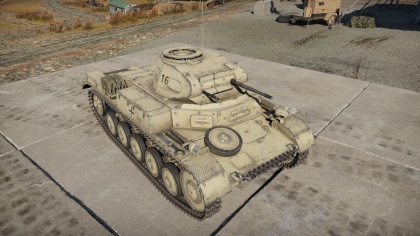 In the 1940s, the Panzer II was upgraded to the Panzer II Ausf. F, which entered into production in 1941 with increased armour and a torsion bar suspension system. A total of 524 Ausf. F were produced between March 1941 to December 1942. The Panzer II would serve in the initial stages of World War II in the Battle of Poland, France, and Operation Barbarossa as Germany's most numerous tank (By May 1940, there were about a thousand Panzer Is and IIs, but only 381 Panzer III and 290 Panzer IVs). The Panzer II also saw service in the German Afrika Korps (Deutsches Afrikakorps, DAK) during the Northern Africa campaign. By 1941, it was clear that the Panzer II was starting to become obsolete, and with increasing quantity of Panzer IIIs and IVs, the Panzer II was relegated to reconnaissance duties when going against the Allies. Despite the up-armouring in the different Panzer II variants, the Panzer II could still be penetrated by most towed anti-tank weapon in service at the time, leaving the crew at risk to enemy fire. By 1942, it was largely removed from front lines and production ceased by 1943. The turrets of these obsolete tanks were used as gun turrets on defensive bunkers on the Atlantic Wall, and the chassis stayed in use for other purposes, such as a self-propelled gun and tank destroyer in the Wespe and Marder II respectively. 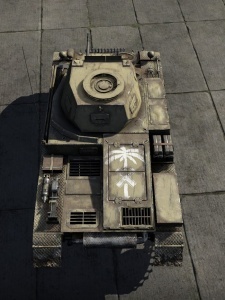 Panzer II DAK's roof, showing the Afrika Korps symbol. The Panzer II DAK was available to be earned during the German Unity Day in October 2017. If already unlocked, the player could also receive Flegel's Bf 109A, and 250 GE if a player also has that plane as well. This page was last edited on 20 March 2019, at 15:25.